Lenovo ThinkAgile SX2200N delivers a pre-integrated, easy-to-deploy rack-level solution that dramatically reduces time-to-value and total cost of ownership (TCO). The solution is based on Lenovo Converged HX3310 appliances that combine industry-leading hyperconvergence software from Nutanix with Lenovo enterprise platforms that feature Intel Xeon processor E5-2600 v4 product family. This product guide provides essential pre-sales information to understand the Lenovo ThinkAgile SX2200N, its key features and specifications, components and options, and configuration guidelines. This guide is intended for technical specialists, sales specialists, sales engineers, IT architects, and other IT professionals who want to learn more about the Lenovo ThinkAgile SX2200N and consider its use in IT solutions. Product availability: ThinkAgile SX2200N is available only in China. ThinkAgile SX2200N integrates computing, storage, networking, and management, and the solution is pre-tested, factory configured, and is delivered ready to go. Starting with as few as four nodes to keep your acquisition costs down, the ThinkAgile SX2200N is capable of immense scalability as your needs grow. Suggested workloads for the ThinkAgile SX2200N include virtual desktop infrastructure (VDI), server virtualization, private/hybrid clouds, enterprise applications, and databases. The ThinkAgile SX2200N is built on Lenovo Converged HX3310 appliances that feature enterprise-class reliability, management, and security, and they deliver the industry’s most feature-rich hyperconverged infrastructure to enterprise datacenters. The ThinkAgile SX2200N ships fully integrated into a rack cabinet, tested, configured, and ready to be plugged in and turned on; it is designed to integrate into an existing infrastructure effortlessly, to dramatically accelerate time to value and reduce infrastructure maintenance costs. Lenovo provides a single point of contact for supporting the entire ThinkAgile SX2200N solution with the nodes, networking, and software components, for quicker problem determination and minimized downtime. Lenovo ThinkAgile SX2200N integrates computing, storage, networking, and management, and is designed with industry-standard building blocks, including hyperconverged Nutanix appliances that are built on powerful and highly reliable Lenovo servers, RackSwitch networking, and software for managing the infrastructure as a single system. Scalable ThinkAgile SX2200N configurations of a complete on-premises hyperconverged platform designed to optimize your workload’s performance to provide the IT agility your business demands. Factory-integrated, pre-configured ready-to-go solution that is delivered in a rack with all the hardware you need for your workloads: servers, storage, and network switches, plus essential software tools. Designed for effortless integration into existing infrastructures, thereby reducing deployment time and saving money. Lenovo deployment services that are included with the solution help get customers up and running quickly by allowing to begin deploying workloads in hours — not weeks — and realize substantial savings. Proven and reliable Converged HX3310 appliances featuring Intel Xeon processor E5-2600 v4 product family provide compute power for a variety of workloads and applications. The HX3310 appliances deliver enterprise data storage as an on-demand service by employing highly distributed software architecture to provide a rich set of software-defined services that are entirely VM-centric, including snapshots, high availability, disaster recovery, deduplication and more. Nutanix software offers a natively integrated solution for data protection and continuous availability at VM granularity and gives administrators an affordable range of options to meet the recovery point objectives (RPO) and recovery time objectives (RTO) for different applications. The Nutanix platform is fault resistant, with no single point of failure and no bottlenecks with shared-nothing architecture, where all data, metadata and services are distributed to all nodes within the cluster, and is built to detect, isolate and recover from failures anywhere in the system. The Nutanix platform combines web-scale capabilities with an intuitive user-centric management experience to simplify every aspect of the IT infrastructure lifecycle and provide a single pane of glass to monitor and control Nutanix clusters, with simplified workflows and rich automation for common administrative tasks. Nutanix software combines powerful features, such as two-factor authentication and data-at-rest encryption, with a security development lifecycle that is integrated into product development to help customers meet the most stringent security requirements. Lenovo RackSwitch switches deliver exceptional performance and low latency, along with cost savings, and are designed to perform seamlessly with other vendors' upstream switches. Powerful tools to manage both hardware and applications that come integrated into the ThinkAgile SX2200N solution simplify and automate the management of the entire solution, allowing you to manage the infrastructure as a single system, rather than as individual components. Enables you to centrally manage virtual and physical resource pools, eliminate planned and unplanned workload downtime related to physical hosts, and avoid disruption and wasted time with predictive analytics across the application-to-infrastructure topology, for a more efficient data center and increased productivity. All the components of the solution are available through Lenovo, which provides a single point of contact for all support issues that you might encounter with the server, networking, storage, and software used in the solution, for quicker problem determination and minimized downtime. The front and rear views of the ThinkAgile SX2200N 42U are shown in the following figure. The following table lists the system specifications of the ThinkAgile SX2200N. IEC 320-C13 to C14 AC power cables for connecting all the equipment in a rack to PDUs are included. Hardware warranty Three-year or five-year customer-replaceable unit and Technician Installed Parts limited warranty with selectable service levels: 9x5 next business day (NBD), 24x7x4, and 24x7x2. Optional 1-year or 2-year post-warranty extensions. Software licenses Lenovo XClarity Pro 3-year software and support license is included. Nutanix Acropolis Pro or Ultimate edition software (selectable). VMware vSphere 6 Standard and vCenter Server 6 Standard 3-year software and subscription licenses can be ordered, if required. Management software Lenovo XClarity Administrator, Nutanix Prism, VMware vCenter (if selected). Memory 24 DIMM sockets with support for 8, 16, or 32 TruDDR4 RDIMMs (16 GB and 32 GB) or LRDIMMs (64 GB). Memory speed up to 2400 MHz. ECC and Chipkill memory protection. Memory capacity Up to 1536 GB with 24x 64 GB LRDIMMs. Boot drive 1x Embedded 64 GB SSD (6 Gbps SATA DOM) connected to the onboard SATA controller. One or two dual-port 10 GbE SFP+ (Intel X520) adapters connected to the VM/storage network with SFP+ DAC cables included. 4x 1 GbE ports (RJ-45) (not used). 1x 1 GbE dedicated IMM management port (RJ-45) connected to the management network with one UTP Category 5E cable included. Front: 2x USB 2.0 and 1x DB-15 VGA. Rear: 2x USB 3.0 and 1x DB-15 VGA. Management features Integrated Management Module II (IMM2.1) with Advanced Upgrade for remote presence (graphics, keyboard and mouse, virtual media), predictive alerts, light path diagnostics. Security features Power-on password, administrator's password, Trusted Platform Module (TPM) 1.2 or 2.0 (configurable UEFI setting). Video Matrox G200eR2 with 16 MB memory integrated into the IMM2.1. Maximum resolution is 1600x1200 at 75 Hz with 16 M colors. Cooling Calibrated Vectored Cooling with seven redundant hot-swap system fans; dual fan zones with N+1 fan redundancy. Power supplies Two redundant hot-swap 900 W High Efficiency Platinum AC power supplies. Nutanix Acropolis Hypervisor (default factory preload). VMware ESXi 5.5 Update 3, 6.0 Update 1, or 6.0 Update 2 (optional factory preload). Optional support for Microsoft Windows Server 2012 R2 Datacenter Edition (Hyper-V) (field-installable option only). Management network 2x RackSwitch G8052 Gigabit Ethernet switches (7159-HCQ), each with 48x 1 GbE RJ-45 ports and 4x SFP/SFP+ uplink ports. VM/storage network 2x RackSwitch G8272 10 Gb Ethernet switches (7159-HCR), each with 48x 10 GbE SFP/SFP+ and 6x 40 GbE QSFP+ ports. Layer 2 and Layer 3 switching, VLANs, VLAN tagging, spanning tree, link aggregation, Hot Links, Layer 2 failover, VRRP, QoS, IP v4/v6 management and routing. Layer 2 and Layer 3 switching, VLANs, VLAN tagging, spanning tree, link aggregation, Hot Links, Layer 2 failover, VRRP, QoS, CEE, IP v4/v6 management and routing. G8052: Three 2+1 redundant hot-swap fans. G8272: Four 3+1 redundant hot-swap fans. Note: You are required to engage a Lenovo representative in the project that includes the ThinkAgile SX2200N. Lenovo XClarity Pro 3-year software and support license is included. 3-year or 5-year CRU limited warranty with Technician Installed Parts. The following sections provide details for each configuration step. The following table lists the base model of the ThinkAgile SX2200N rack cabinet. Configuration note: 1U and 3U Filler panels will be derived based on the number of nodes selected. Power distribution units (PDUs) are used to distribute power from an uninterruptible power supply (UPS) or utility power to the equipment within the ThinkAgile SX2200N rack cabinet and to provide fault-tolerant power redundancy for high availability. Each ThinkAgile SX2200N node, management network switch, and VM/storage network switch has two redundant power supplies, and each of two power supplies is connected to a separate PDU to support topologies with redundant AC power sources. The power distribution topology is illustrated in the following figure. The following table lists the power distribution units for the ThinkAgile SX2200N rack cabinet. * The PDU quantity shown is for 4 - 8 nodes / 9 - 16 nodes. Only one type of PDUs is supported within the ThinkAgile SX2200N rack cabinet; different PDU types cannot be mixed within the rack. Power cables are derived based on the number of nodes selected. The following table summarizes the PDU specifications. The ThinkAgile SN2200N uses the Lenovo Converged HX3310 nodes. The HX3310 is a 1U hyperconverged appliance from Lenovo that combines industry-leading hyperconvergence software from Nutanix with Lenovo enterprise platforms that feature Intel Xeon processor E5-2600 v4 product family. The following table lists the base configuration of the HX3310 for ThinkAgile SX. * Processor model is selectable (See Processors). ** Memory capacity is configurable (See Memory). The HX3310 for ThinkAgile SX requires two processors of the Intel Xeon processor E5-2600 v4 product family. The following table lists the specifications of the processors that are available for the HX3310. The following table lists feature codes of the supported processors. The HX3310 for ThinkAgile SX Series supports up to 24 DIMMs of TruDDR4 memory. Each processor has four memory channels, and there are three DIMMs per channel. The following table lists the memory options that are available for selection. Lenovo engineering tested and validated system designs that support memory speeds beyond Intel memory specifications, which provides benefits for workloads that require memory speed and density. The following table lists supported memory configurations and maximum operating speeds for the HX3310 appliances. Note: Cells highlighted with a gray background indicate when the number of DIMMs per channel allows the DIMMs to operate faster than Intel specifications define, while still maintaining world-class reliability. The HX3310 appliance supports the internal drive bay configurations listed in the following table. The following table lists the hard drive options that are available for selection. The following table lists the solid-state drive options that are available for selection. Note: Self-encrypting drives and drives without encryption (both HDDs and SSDs) cannot be intermixed in the same appliance, that is, all drives in the appliance (both HDDs and SSDs) should be either self-encrypting or without encryption. The HX3310 appliance provides two- or four-port 10 GbE network connectivity by selecting one or two Intel X520 adapters that provide two 10 GbE ports with SFP+ connectors each. 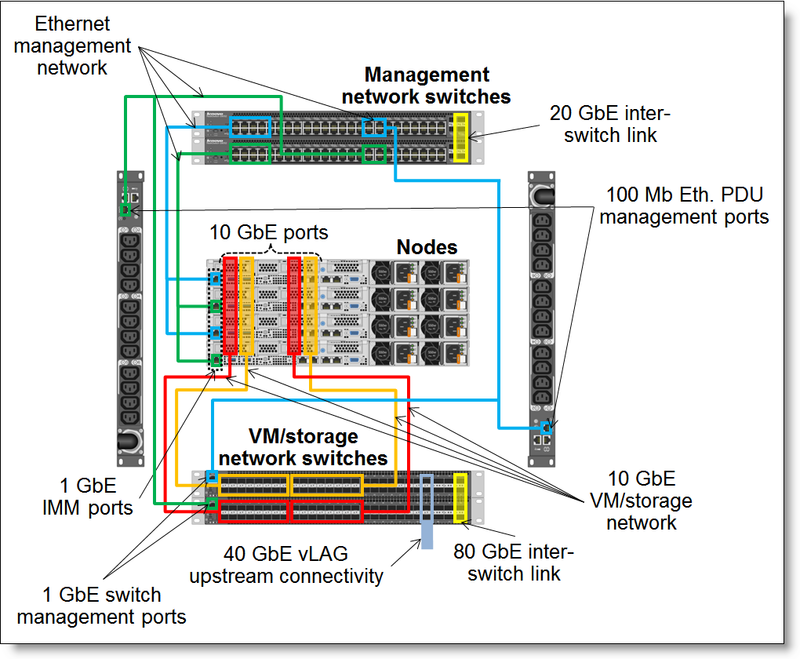 The following table lists the 10 GbE network adapter options that are available for selection. The following table summarizes features of the 10 GbE network adapters. Configuration note: All 10 GbE SFP+ DAC cables for the VM/storage network are derived based on the number of HX3310 nodes selected. 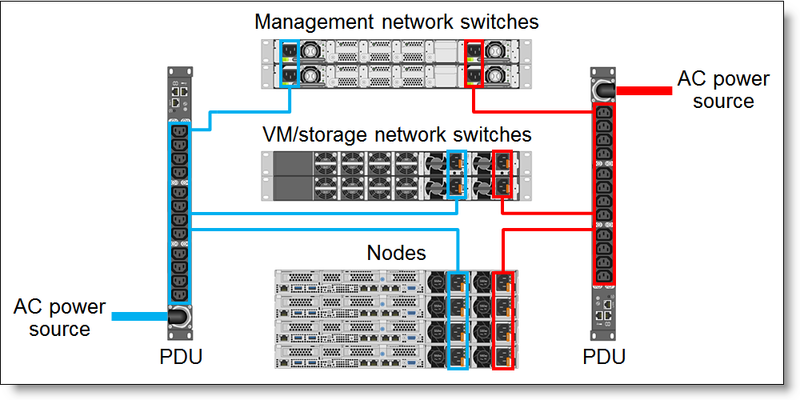 The ThinkAgile SX2200N uses Lenovo RackSwitch G8052 and G8272 switches to provide management and VM/storage network connectivity, respectively. Each network uses a pair of switches for availability and redundancy purposes. Dedicated IMM management ports on the HX3310 nodes in the odd and even EIA rack locations, management ports on the G8272 VM/storage network switches, and management ports on the monitored PDUs on the different sides of the rack cabinet are connected to a pair of the G8052 management network switches. The management network is isolated, and the G8052 switches are connected to each other via two 10 GbE links configured in a link aggregation group (LAG). 10 GbE node ports on the dual-port adapters are connected to a pair of the G8272 VM/storage network switches. The switches are connected to each other via two 40 GbE links configured as a LAG. Each of two G8272 switches provides two 10 GbE uplinks that are configured in a virtual link aggregation group (vLAG) for upstream network integration. If required, the number of uplinks can be increased to four per switch. Data/storage network uplinks are 5 m MMF OM3 fiber optic cables with LC connectors. The network connectivity topology is illustrated in the following figure. The following table lists available switches. 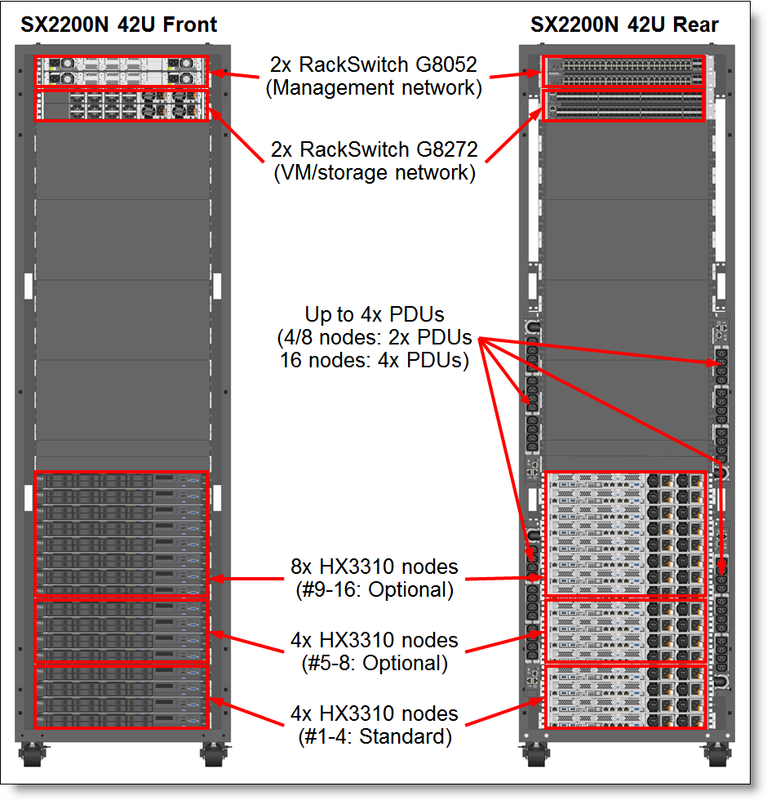 The following table summarizes specifications of the RackSwitch switches for ThinkAgile SX. The following table lists SFP/SFP+ transceivers that are available for selection for the G8272 uplink ports. Configuration note: All UTP Category 5E cables for the 1 GbE management network and 10 GbE SFP+ DAC cables for the VM/storage network are derived based on the number of HX3310 nodes selected. Optionally, VMware vSphere 6 Standard and vCenter Server 6 Standard 3-year software and subscription licenses can be ordered, if required (see the following table for details). * The number of vSphere licenses is equal to the number of HX3310 selected. The HX3310 appliances can be configured with one of the Nutanix Software editions that are listed in the following table. The appropriate license can be downloaded from the Nutanix website to match the serial number of the appliance. It is possible to upgrade a software edition after the installation by purchasing the software upgrade option listed in the following table. Configuration note: You should request a quote for this part number from Lenovo and provide additional details on the existing installation and planned upgrade. * Data-at-rest encryption requires self-encrypting drives (SEDs). Prism Element (included in Pro and Ultimate Nutanix software editions): Provides ability to configure, manage, and monitor a Nutanix cluster. Prism Central (included in Pro and Ultimate Nutanix software editions): Provides centralized management of multiple local and remote Nutanix clusters. Prism Pro (Optional software license): Enables efficiency evaluation, capacity planning, expansion recommendations, custom dashboards, and advanced search capabilities. The ThinkAgile SX2200N can be configured with a three-year or five-year hardware warranty and software support with standard call center support and various levels of coverage with a well-defined scope of services, including service hours, response time, term of service, and service agreement terms and conditions. Technician Installed Parts If a problem with your product cannot be resolved via telephone, a Service Technician will be dispatched to arrive at your location. 24x7: 24 hours per day, 7 days per week, 365 days per year. Response time target 4 hours or Next Business Day: The time period from when the telephone based troubleshooting is completed and logged, to the delivery of the CRU or arrival of a Service Technician and part at the Customer’s location for repair. The ThinkAgile SX2200N also includes a three-year or five-year Nutanix software support and subscription (matches the duration of the selected hardware warranty period) that entitles you to submit service requests to troubleshoot Nutanix software issues and receive code updates, including fixes, patches, and new software releases.